TMC Dumont, hubless motorcycle with an airplane engine, has one of the coolest and craziest designs. 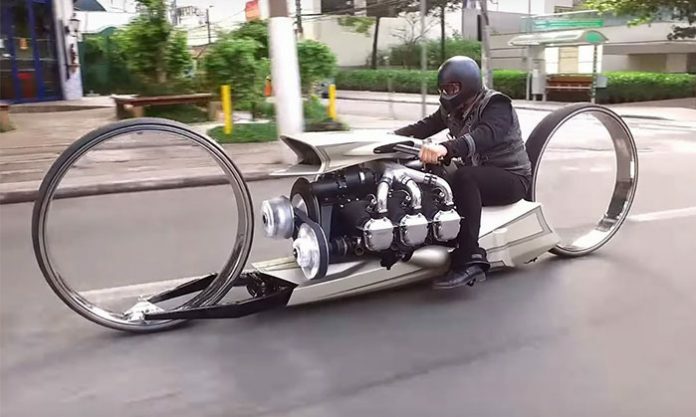 Ever imagined a motorcycle with a Rolls-Royce aircraft engine? You have to be a wild daydreamer if your answer is yes! It would please you to know that there is an actual inventor with an equally wild imagination. He has designed a motorcycle that is best described as ‘pretty ambitious, probably impractical but awesome’ – The TMC Dumont Motorcycle. And if your answer is no, you should read on to know more about the motorcycle with the engine of an aircraft. Tarso Marques, the Brazilian ex-Formula One driver, designed the TMC Dumont Motorcycle. The motorcycle gets its name from Alberto Santos Dumont, a Brazilian inventor and aviation pioneer. A 300hp 6-cylinder Rolls Royce engine from a 1960s aircraft powers the motorcycle. However, the engine isn’t the only weird thing about the motorcycle. The TMC Dumont Motorcycle sports 36-inch hubless rims, the largest you’ll ever see on any motorcycle, according to Tarso. Furthermore, the wheels are attached to the base of the rim, a design concept that gives the motorcycle a ‘floating’ appearance. Tarso himself admits that the wheels are intentionally designed and crafted to ‘invoke the biggest reaction from the observer.’ And he couldn’t have been more successful. According to Tarso, it took about 15 years of imagination and research to bring the TMC Dumont to life. A major factor behind the lengthy period of development is the fact that he wanted the project to be 100% Brazilian. Right from the creation of the chassis to painting the frame, the entire motorcycle was manufactured without any foreign supplier. That the TMC Dumont can actually move is miracle enough; it looks nothing like a regular motorcycle and it would never be a regular motorcycle. Tarso himself admits enjoying the outlandish design of the motorcycle and the disbelief on the faces of onlookers when they see it move. To actually prove to everyone that the motorcycle can move, Tarso rode the TMC Dumont to the Daytona Motorcycle Week. The motorcycle eventually won big at the show. Asides the general weird design of the motorcycle, the positioning of the rear wheel further makes it a bit impractical to drive. The rear wheel is too close to the rider, such that there is no room for leaning back while riding. Although the motorcycle comes with a speedometer, the manufacturer is silent about its top speed. Moreover, the design of the wheels gives very little to hope for. The TMC Dumont is more of an exhibition motorcycle. There is little to suggest that it might be put up for sale. Currently, the manufacturer has not released any information about the cost of the motorcycle.